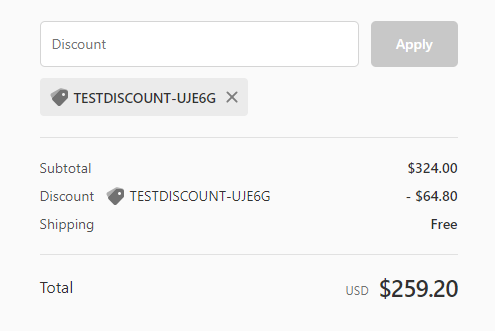 While testing you may find that an incorrect discount code is found in the checkout. Why does this happen? Discount Ninja applies discount codes automatically to the checkout. It cannot, however, remove discount codes (not supported by Shopify). You test a promotion with a product that should be discounted. Discount Ninja adds the correct discount code to the checkout. This issue typically does not occur often and has a minor impact. It may create some confusion with customers who do end up seeing Shopify's "Your cart does not meet the requirements for this discount code" warning message. 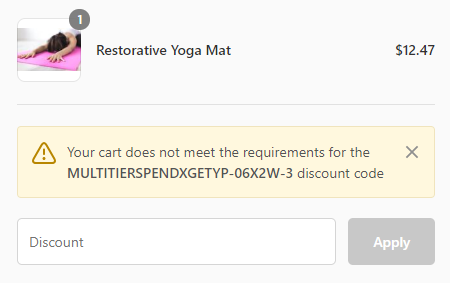 When on the checkout, remove the discount code by clicking the little X next to it. Test each scenario in a private browsing session (see this article on how to do that). Discount Ninja has two checkout modes, read more about that here. This article discusses an issue that only occurs on the standard checkout mode. The Draft Order checkout mode does have this problem.